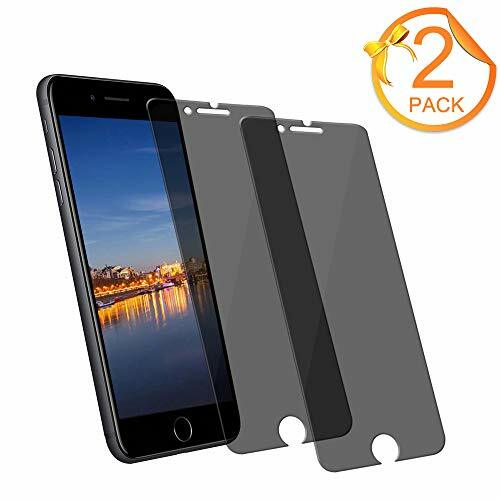 [2-Pack]Eastoan iPhone 8 Plus Tempered Glass Privacy Screen Protector [No bubbles][9H Hardness]For Apple iPhone 8 Plus and iphone 7 Plus Privacy by Eastoan at Got Busted Mobile. Hurry! Limited time offer. Offer valid only while supplies last. Product Feature: 1. Privacy protection, block views from the left and right side within 45 degree, only visible to persons directly face the screen. 4. Easy install position sticker, lined up correctly and easily. 5. hydrophobic and oleophobic coating helps it fingerprint resistant. 1. If there is large bubble, you can wipe again and then re-attach it since there may be smudge or dust on screen. 2. If there is small bubble, don't worry since it will disappear by itself after 24 hours. 3. If bubbles do not disappear or any confuse about the installation, please feel free to contact us as soon as possible. If bubbles do not disappear or any problem, please feel free to contact us! DAILY PROTECTION - Designed with a hydrophobic and oleophobic coating and an anti-scratch surface to protect your screen from accidental spills, oil residue from fingerprints, bumps and daily wear-and-tear. Extremely high hardness- 9H hardness featuring maximum protection from daily scratches, shocks, bumps and smudge. LIFETIME WARRANTY - No-hassle warranty provides easy lifetime protection for your privacy screen protector. If you have any questions about this product by Eastoan, contact us by completing and submitting the form below. If you are looking for a specif part number, please include it with your message.